NEW BRITAIN - After its latest loss, the Innovation boys basketball team was left speechless. In a 66-47 loss to neighboring Goodwin Tech on Friday night, Innovation was held to just 28 points through three quarters. Only in the final eight minutes were the Ravens able to score consistetly, against the Gladiators’ backups. As a team heading to the postseason for the first time later this month, Innovation knows it will have to learn from its performance. As the Ravens prepare for their next game, they will need to work on keeping their intensity up throughout all four quarters of each contest. Aside from bringing energy to the court, the Ravens need work on rebounding the ball. As a senior, Henderson has high goals not only for himself, but his team as the season winds down. 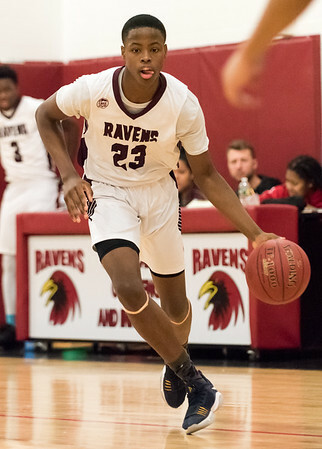 One of Henderson’s main goals is to be a better role model for the Ravens as they head into the CRAL Championships next week. As the Ravens tune up for their conference semifinal game against Aerospace, they will be aiming to work toward the success they enjoyed throughout the regular season. Posted in New Britain Herald, Innovation on Sunday, 18 February 2018 22:46. Updated: Sunday, 18 February 2018 22:48.